The Audi A7, like it’s name, is a model positioned between the Audi A6 and the Audi A8. It is a direct contender for the Mercedes Benz CLS Coupe, part of a new wave of 4-door “coupes”, which are basically normal sedans with a sporty coupe-like rooflike. 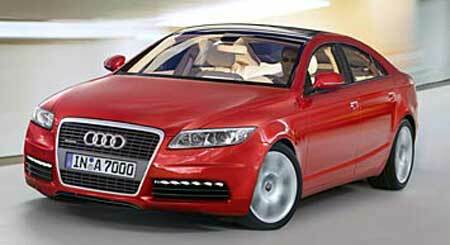 It’s expected that the Audi A7 will make it’s first debut to the world at the LA Motor Show this November 2006. There have already been spyshot sightings of the A7 making it’s rounds around the infamous Nurburgring test track. The car is expected to come with 6 engine offerings, both petrol and turbodiesel, with the top of the line having the Lamborghini-derived V10 to be introduced in the Audi R8. Currently, Mercedes Benz is the only one with a four-door coupe car on the market. There are no competitors. This has sent companies like Jaguar and Volkswagen to develop their own four-door coupe competitors as well. Jaguar is developing an XJ replacement, and Volkswagen is developing a Passat-based coupe.